Can’t wait to hear about how well she’s doing. Good luck with your tour. Hi Novella, it was great to see you on Friday at the Ferment Change fundraiser dinner. The event went great and we raised much needed $$ for City Slicker Farms. You are a driving force for the local foods movement and a great asset to Oakland and the East Bay. Best of luck on your book tour! p.s. I am enjoying the stories in Farm City … got the paperback version at Pegasus in Berkeley. I just finished your book about a week ago. I was interested, initially, because I would LOVE to have some chickens of my own, and I’m growing my first veggie garden this year. However your book pried open my eyes and I have now started recycling and just yesterday bought a compost tumbler, enlisted my husband to put it together immediately, and taught my 6 year old how to use it. Yes, I’m on a roll. OH! And I’m blogging about it all! You rock Novella, keep it up! AAAACK! You’re coming to Philadelphia and I can’t go! I’m so, so bummed out. Hope it’s a great show–are you on Radio Times or Fresh Air while you are here?! Hope you have a great crowd & enjoy our city! Whenever I see you, or even other authors, posting your schedule of stops I always wonder to myself, why doesn’t anyone ever come to Salt Lake City? Now I see you are coming!! I really really hope to get there and hear what you have to say. How about adding Montana to your list of stops? I’m hoping to be able to split my hive for the first time next summer, wondering if I dare try to let them requeen themselves — esp. if there are queen cells present with the brood. Here’s to hoping your bees dig their new queen. Safe travels! I really hope your little lady works out! And be safe on your journey. so we talked in the fall about you coming to detroit, what ever happened to that plan? Yay! See you in Baltimore tonight! I’ve been thinking about keeping bees (and chickens) for some time, and having just finished Farm City I’m even more inspired to just do it. Can you recommend any good resources on beekeeping and/or backyard chickens? I worked for a farm in Wales with bees. I loved being part of the honey harvesting process. I took away some pretty awesome honey too! Safe travels and can’t wait to hear more about your bees and goats. I am super excited because you’re coming here to Baltimore tonight! I picked up your book to read and it has just snapped me to life. We live in the city with a tiny plot of land and I was worried about attracting rats with fallen veggies. But I think we’re gonna start small. I would kill for bees though! the bee experience has really gone wild for me this year, with my 3 keeper pals. for one reason or another, it’s all clicking for me this year, and I’ve had the chance to meet with organic beekeepers in HI and led a farm tour to a local beekeeper / honey operation. this guy is amazing! he’s building the strength of his hives and seriously going all natural… using all essential oils, all this great stuff he learned when he went to “teach” beekeeping in the Republic of Georgia a few years back. In fact, i’m going today to buy some of the sugar patties they MAKE with thyme oil, which evidently sterilizes the Varroa mite!!! oh, and I definitely need a t-shirt! i may get a bundle and sell through slow food spokane, if you’d be groovy with that? oh, and we started one hive with a split this year, going for a second as of this week. we had one hive recently become a queen factory! left the ones on the foundation in there, since my new expert confirmed our suspicions that it meant the hive felt it needed a new queen. all the ones hanging off the sides/bottoms of the frames needed destruction or placement in a starter hive, so we did all that. 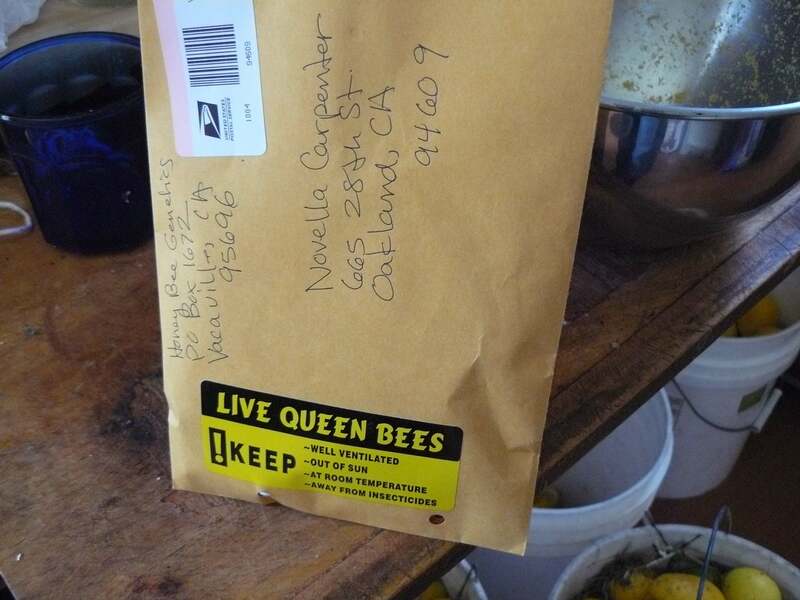 this is our first year using the queen cells that get created… hope they lay friendly bee eggs! 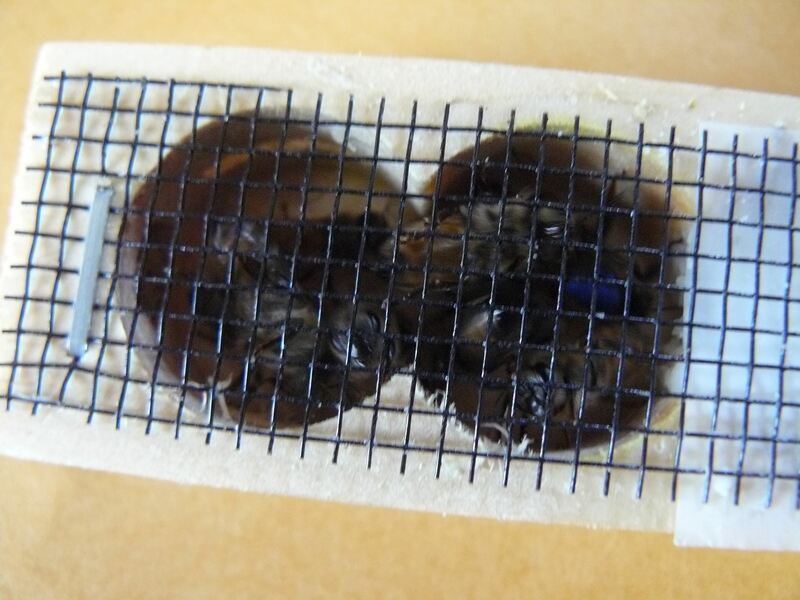 the split and new queen seem to be working. there are bees buzzing in and out. i haven’t done a proper inspection (too busy) and i want them to settle in completely before i go in there. anyway, i think it worked! and i just harvested two supers off my other hive (the one i took the split) and got 17 quarts of honey! holy crap, that’s like a quart per frame. they are so good. next year i’m going to split them early and let them make a new queen because they are rock stars.